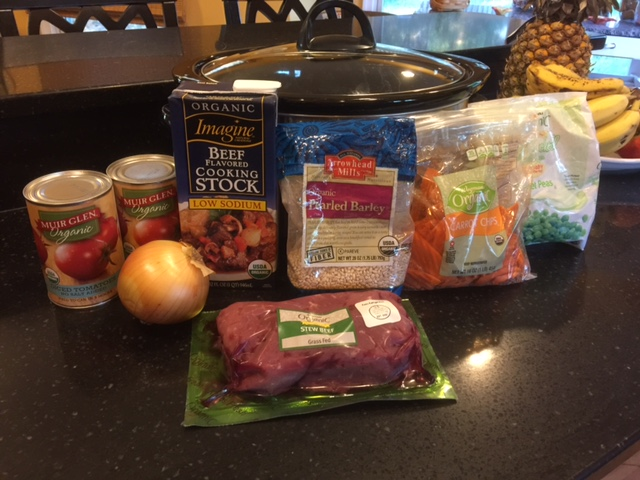 Today I thought I would share with you my favorite Beef Barley Crockpot Soup recipe. This time of year always gets a bit crazy. Work, school, & afterschool activities make getting dinner on the table a challenge. It’s also the perfect time for a hot bowl of soup. 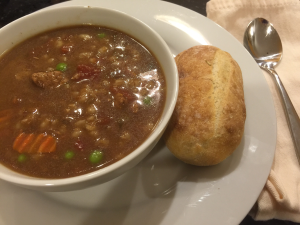 This is my No Fail slow cooker soup for when I have no time to make dinner but want a hot meal on the table for my family. Don’t be afraid to buy pre-chopped frozen vegetables to cut down on prep-time. If your family likes veggies, add what they love. This soup is so yummy and filling I’m sure your family will love it. Enjoy! Throw everything but the peas in a slow cooker on low for 8 hours (or high for 4 hours) and walk away. 30 minutes before dinner, throw in the frozen peas and give it a stir. Serve with a fresh salad and bread. Serves 4-6. If you have leftovers, pop them in the freezer for a quick thaw and eat meal another day when you don’t feel like cooking. If you liked today’s post, you’re welcome to use it in your own newsletter or blog as long as you include the following blurb: Joan Robinson, Senior Project Manager, helps working moms and families focus on what’s important. Get our FREE weekly tips and advice at www.NoMorePiles.com.